Here are some of the most frequently asked questions about international shipping from China. Hope you can find your answers easily and quickly. If you need further assistance, please feel free to get touch with us. As an experienced forwarding company specialized in international shipments, we’re always here to help. Q: Who is your target customer? A: We focus on small to medium sized businesses all over the world. We help them save time and money. Due to the large volume of shipments that our customer base processes, we have been able to negotiate cheaper shipping rates directly with the main carriers in China. Q: I already have a freight forwarder in my country, why bother to find one in your country? A: We strongly suggest you should find a local forwarding agent in China, hopefully us. Not just cheaper. Find more advantages of working with a local China shipping company. Q: Is there a charge to use your service? A: There is absolutely no charge to utilize our services. You will only ever pay for the actual transport charges that your shipments incur. A: AWB, short for Airway Bill, is a transport document for Air freight. The Air Waybill number and flight information enables tracking of your cargo. The cargo rights will be changed from the supplier to the consignee, once the airplane departs. Q: What is FCL & LCL? A: FCL means full container load. LCL means less container load. They are two common terms used in shipping under international trade business. Besides, FTL (full truck load) and LTL (less truck load) are used in land transportation. FCL is the most optimized container shipping way regarding cost, volume and weight of the goods. The FCL process involves – picking up empty freight container in the container yard, loading at the shipper facility, transporting by truck / rail to the port of loading and further sea / ocean container shipping of the goods to the port of arrival and delivery to final destination. In certain circumstances of sea cargo transportation if you don’t have enough products for a full container load we still recommend you to consider FCL option. You may find FCL compared with LCL (Less than Container Load) to be more efficient, cost-effective, and convenient than other logistics services for you. Find more: Why you should buy FCL not LCL? Q: What is the minimum weight of Air Cargo? A: The minimum weight of air cargo is 45kg, while we recommend is 100kg. Less than 100kg by air freight is not competitive than international couriers via DHL, FedEx, UPS, EMS. Visit here to learn more. Q: What does volumetric weight mean for air freight shipments? According to the international air cargo convention to charge for weight or volume, above is the formula for which is the greater volume to ensure that the air carriers receive a reasonable amount of revenue for light items. Q: How much does it cost if I want to transport from china to my country? A: Firstly, it depends on the mode of transportation you choose. Usually cost 3 to 5 days by air is more expensive than by ocean, which may spend for as long as a month. Secondly, we need you to provide detailed information about your shipment to calculate standard price. Q: How long will it take for my shipment to get to its destination? A: Usually, it takes within 3-5 days for air cargo shipping. Please note that these transit times are not guaranteed and can vary from destination to destination. Q: What’s your railway transport routes? International railway container and railway wagon transportation services from all Chinese main cities via Manchuria to Russia, Belarus, Ukraine and Azerbaijan. 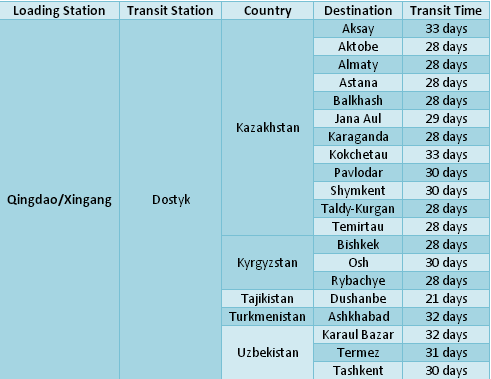 International railway container or railway wagon transportation services from all Chinese main cities to Kazakstan, Uzbekistan, Turkmenistan, Kyrgyzstan, and Tajikistan via Alataw Pass. International railway container and railway wagon transportation services from all over the world via Erlian to Mongolia and Russia. International railway container and railway wagon transportation services to the DPRK. International railway container and railway wagon transport services to the Far East region of Russia via Suifenghe, Heilong Jiang province. Q: I have bought many different items of goods from cities around China, could you gather together to send me? A: Yes, we can. You need firstly provide the contact information of each supplier and the detailed information of your cargo, then the mode of transportation (sea/air/courier) you choose. We promise to offer you quality service. Q: Could you recommend the most cost-efficient mode of transportation? If the stuff you bought is in large scale and time is out of your consideration, sea freight will be your best choice. But if your clock is ticking, we recommend you the thorough air transportation which may cost much more. Just contact us to discuss your specific logistics needs. We have a detailed guide to shipping from China. It may help you make the right decision easier. Q: How much information should I give to book my shipment? A: Please provide as much information as possible, or simply fill our quote form. We’ll handle the rest. If you’re not so clear about everything, we’ll contact your supplier directly and keep you noted. We should come to an agreement on the following questions before the actual process. 1. How is the cargo packaged? Pallets, boxes, or other packaging? How many pieces totally? Weight and dimensions? 2. Incoterms with your supplier. We suggest choose FOB instead of CIF. For example, FOB Shanghai Port. If EXW, please include the detail address. 3. Mode of Transport: By ocean or By air? If by ocean, do you need LCL (less than container)? If Air Freight, please specify how urgent the shipment is. Because the quote is varied of different airlines with different routines. 4. What is the commodity you are shipping? Or what is the Harmonized Tariff Schedule (HTS) Code of your products? Some kinds of goods need special treatment. Q: Are there any restrictions on what I can ship? The size and weight of your shipment might restrict the airline or sea container or vehicle necessary to move your shipment. Also, goods which are classed as hazardous, perishable or high value are regulated by international law. Contact us with the details of your shipment and we can provide the best solution to moving that awkward load. Q: What payment methods should I choose? Q: When should I pay? A: Sea Freight: against the copy of B/L in 5 days. Air Freight: before the airplane depart. Q: What will you do next for customer services once I paid the cost? A: You will be informed at all time about your shipment status with up to date pre-alert, flight schedule, transit status and all other relative information. You will always be informed about your shipments before they arrive so that you can make any necessary customs preparations with your broker to expedite clearance. Besides, we will contact the shipper to make sure that all necessary documents to ensure that you will not experience any delay with customs clearance. Over the past, most importers in China business have encountered lost or misplaced documents. This will result in the delay of delivery and storage charges the same time. We’re here to ensure that you no longer suffer from these problems. Q: Do I need cargo insurance? A: Under limited liability, damaged or lost cargo is assessed by weight, not value. That is to say, there is no guarantee of recovery against a carrier for the full amount of the loss and damage and your compensation may be dramatically less than the commercial value of the goods. However, we recommend goods are adequately covered by insurance. We can buy your freight insurance easily with big discount. A: Yes, we don’t share any of your information with any third parties. You can find it here. Let us know if you need any further assist. You can drop us a note through the right corner. We’d love to hear from you and we’ll get back to you as soon as possible. As Pinterest Goes Public, Hopes Are High for Its E-Commerce. Quote → Book → Pay, just as simple as 1-2-3, you are on the best way to ship from China to more than 220 countries and regions. My machine arrived in good order and I am happy with CFC's shipping arrangements. I received quotes from other forwarding companies but they kept changing the amounts. Your quote was exact and there were no hidden charges. I would be happy to recommend CFC to other importers of goods from China. You have nothing to lose by giving it a shot ... and A LOT to gain. You can expect a response within 12 hours.